What makes Live Lingua Chinese different? Here are just a few of the reasons to study with us at Live Lingua Chinese. 1-on-1 online Chinese classes any day of the week. Our Mandarin Chinese teachers have years of language teaching experience. All of our Chinese tutors can speak a second language. Native Chinese speaking teachers from the Peoples Republic of China. Each Chinese lesson lasts for 60 minutes. Total flexibility for Chinese classes. Enroll in as many or as few hours as you would like. Here is what some of our hundreds of students have said about their Chinese lessons. "What a great idea and service. My job takes me all over Asia, but I am based in Beijing. The problem is that all my coworkers speak English, so between them and my traveling I am not able to learn Chinese. But with my Skype lessons I can have classes consistently. You yigè weidà de rìzi!" "My Chinese teacher is cool. I love my Chinese lessons!" 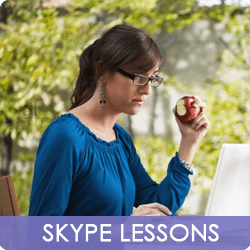 Take a 60 minute trial Skype Chinese lesson with one of our Skype Chinese teachers. No credit card required. Our Chinese teachers have university degrees and years of Chinese teaching experience.